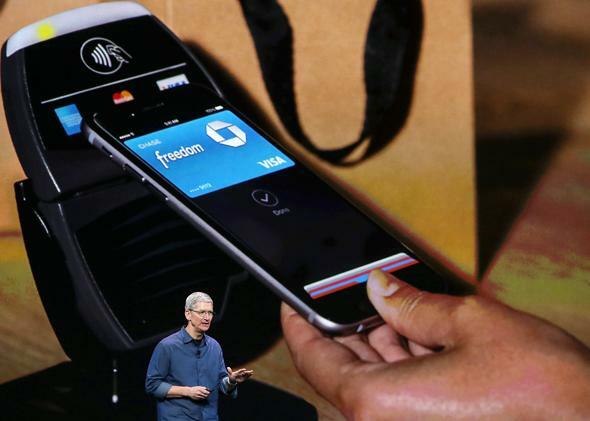 Apple Pay mobile payment system: It could succeed where Google Wallet failed. With its careful and steady approach, Apple may achieve a coup in the credit ecosystem. Apple CEO Tim Cook explains Apple Pay at the Flint Center for the Performing Arts on Sept. 9, 2014, in Cupertino, California. Apple Pay, the new mobile payment system that Apple unveiled this week, looks pretty secure. It looks a lot more secure than the iCloud. As my colleague Lily Hay Newman explained, the combination of biometric authentication (by the Touch ID fingerprint system), near-field communication, and GPS location data makes for a payment process that is vastly more secure than the current credit card system. But that’s not saying much! Credit card fraud is rampant, and a good chunk of the interchange fees that merchants pay to card issuers on every credit card transaction (usually about 2 percent) goes to the issuers’ fraud departments. With credit card data being stolen en masse from Target and Home Depot, Apple has a pretty low bar to clear to improve on the current situation. Even if Apple screws up the security a few times, Apple Pay fraud will probably still be far lower than what we see today with our very insecure stripe cards. Contrast that with personal data account security, where consumers have the expectation that their data will never be stolen. If naked photos were stolen at the rate of credit card numbers, there’d be a riot. Despite Apple’s typically flashy announcement, the technology is really nothing new: PayPal, Square, and Stripe all have footholds in the mobile-transaction market, as does Google Wallet. Apple’s innovation was not in the technology this time, but in the negotiations, in which issuers effectively pay a small part of their interchange fee to Apple. Apple pushed around music labels pretty easily with iTunes, guiding them slowly but forcefully into a world where Apple became the de facto intermediary for online music. The banks and credit card companies are far more formidable foes, both with incredible lobbying arms and known for incredible collusion, and Apple is adopting a gentler strategy. Law professor and credit law expert Adam Levitin says it will be difficult for Apple Pay to make a dent in the complex, crowded credit ecosystem anytime soon, particularly because banks are already trying to introduce better security with their own “chip cards” under the EMV (Europay, MasterCard, Visa) standard. “The issuers are already moving to EMV cards,” Levitin tells me. “Apple Pay isn’t a replacement because an EMV card costs a few dollars to make, whereas Apple Pay requires an iPhone.” If issuers can get a more secure system in place, Apple Pay will be relegated to a luxury niche service for Apple fans. Google, by contrast, took a more ham-fisted and less successful approach with its Google Wallet mobile payments system. (Disclosure: I used to work for Google, and my wife still does.) Google itself became the issuer by wrapping your credit card in its own standardized credit card. This has some advantages: Unlike with Apple, you can use any credit card you like. Even more importantly, Google sees the transactions, which will remain opaque to Apple, allowing Google to learn more about its users. That means Google can do things similar to what the Starbucks app does: place a standing coffee order every time you go into the store, or tell you which coffee is most similar to your favorite Starbucks brand when you go into Peet’s. Apple will not be able to conduct any of what Levitin terms “non-payment information exchange” between customers and merchants—at least, not at the moment. But Google’s approach comes with a huge downside. First, it saddles Google with the nightmare of dealing with all the different card payment mechanisms, effectively forcing it to replicate the credit ecosystem in miniature. Worse, it paints a big target on Google’s back, because Google looks like a competitor to banks and networks rather than a helpful intermediary. No one was going to strike the sort of deal with Google that Apple just got. Consequently, Google had few incentives to offer merchants, and Wallet has languished. Although a breath of fresh air might shake up the credit card industry, this doesn’t necessarily translate into good news for consumers or merchants, however. Grimmelmann puts it this way: “Is it a positive development when Godzilla comes along and starts fighting with Mothra, who’s been beating up on the city?” In other words, it’s good to savor the possibility of Apple beating up the credit card industry, but consumers and merchants will remain the pawns in the battle.